on 17th, July, 2018, the Qi certificate for Esorun’s design patented wireless charging pad (happens to be the world’s thinniest design) has been issued by WPC (the Wireless Power Consortium). Again comes the time of the year that new technology & products shine at the CES show! 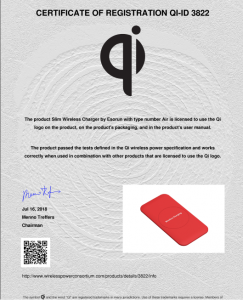 Qi Ceritified for New Wireless Charging Pad with Anti-slide Design for Car & Home Use!